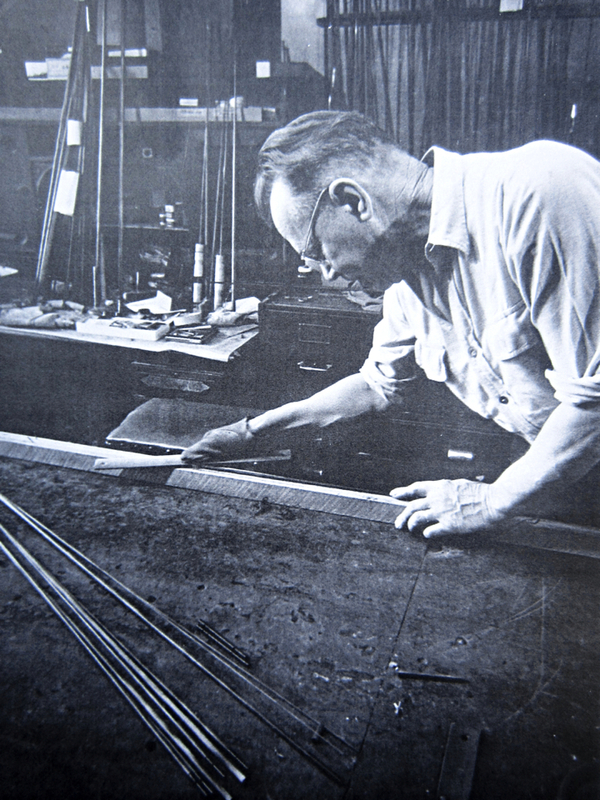 The Paul H. Young Database celebrates the legacy and accomplishments of master bamboo fishing rod maker Paul Holden Young (1890 – 1960). We’ll be under construction for a while as materials are transferred from my earlier site, but there is already a lot of useful information available here for you. Over 1000 Paul H. Young rods built for fly fishing, spinning, and bait casting are listed in this Database. Click on the chestnut-color links in the category boxes on this page to learn about serial numbered PHY rods, non-serial numbered PHY rods, handwriting samples and other identifying marks, and various PHY photographs, tackle catalogs and accessory items. Detailed descriptions and photos are frequently added to the listings. Please bookmark this page and check back often as this site quickly grows. PHY Perfectionist #2024, built by Paul H. Young in April 1955 for his wife, Martha Marie Young. Paul H. Young, working in the rod shop. Thanks to Doug Tierney for making this WordPress site possible. 574 serial-numbered rods are currently listed by Robert Golder. (In total, there are 1121 rods currently listed on this site). 547 rods without serial numbers are currently listed by Robert Golder. Click here to see rod identification markings! Photos of catalogs, fliers, correspondence and accessories help us to better understand the history of the PHY Company.